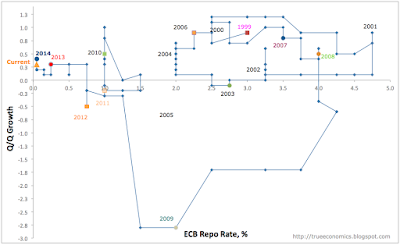 So we have had a massive QE - even prior the current one - by the ECB. 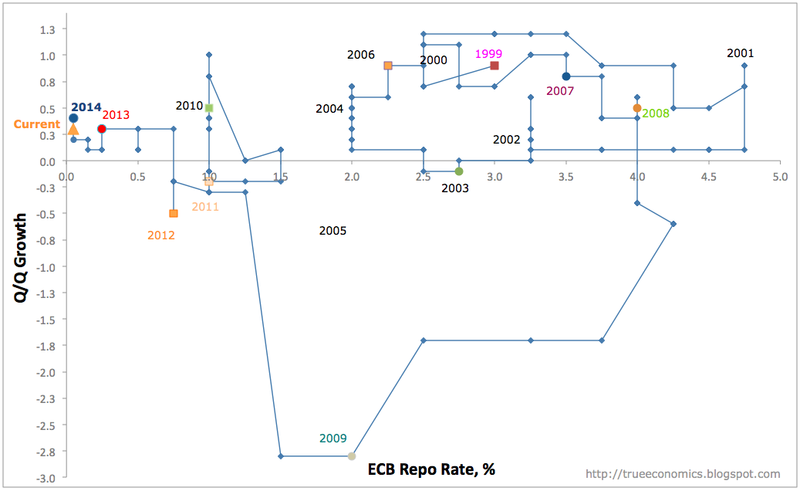 And we are having a massive QE again, courtesy again, of the ECB. And the bond markets are running out of paper to shove into the… you've guessed it… the ECB. And the banks have been repaired. And we are being fed our daily soup of alphabet permutations (under the disguise of the European Union 'reforms' and policy initiatives): ESM, EFSF, EFS, OMT, EBU, CMU, GMU, TSCG, LTRO, TLTRO, MRO, you can keep going… And what we have to show for all of this? 2Q 2015 growth is at 0.3% q/q having previously posted 0.4% growth in both 4Q 2014 and 1Q 2015. 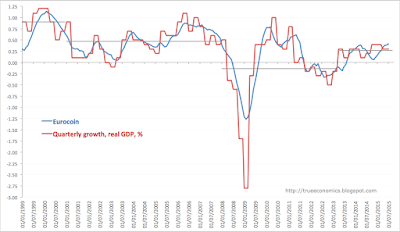 This is, supposedly, the fabled 'accelerating recovery'. So what do we have? Look at the grey lines in the chart above that mark period averages. 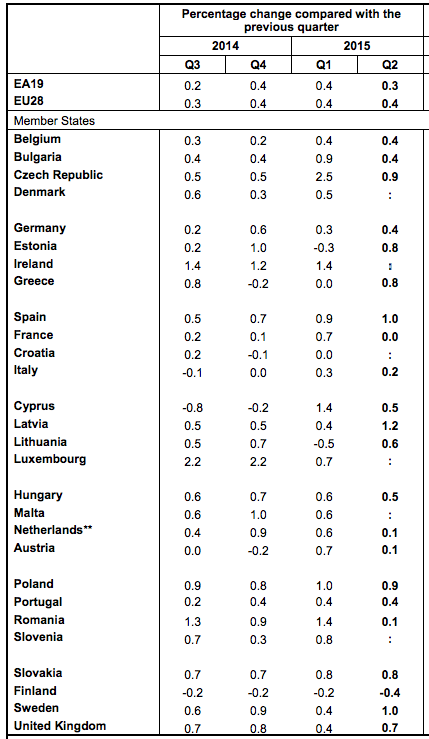 Pre-euro period, GDP growth averaged 0.9% in quarterly terms. 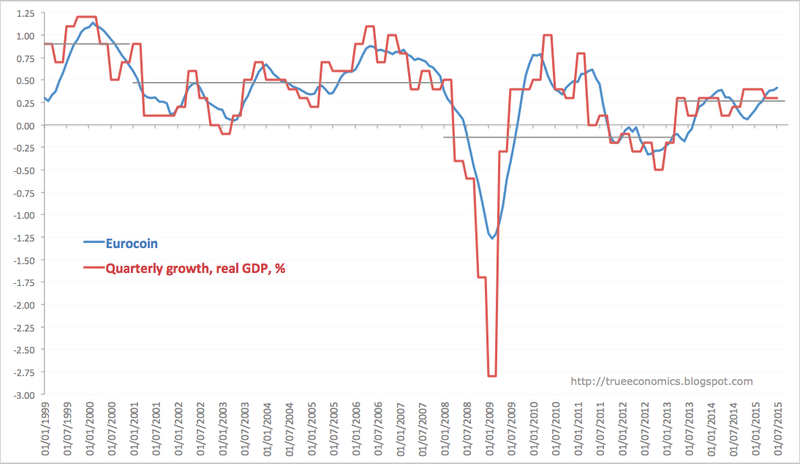 From 1Q 2001 through 4Q 2007 it averaged 0.5%. 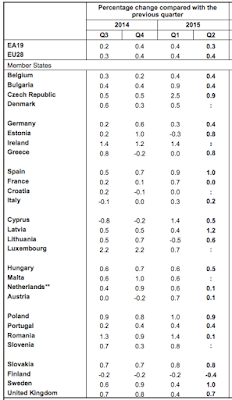 Toss out the period of the crisis when GDP was shrinking on average at a quarterly rate of 0.1% between 1Q 2008 and through 1Q 2013 and look at the recovery: from 2Q 2013 through 2Q 2015 Euro area economy was growing at an average quarterly rate of less than 0.27%.